To save $200, I booked this flight to Missouri by way of SFO rather than Oakland or Sacramento. Either of those would have been closer to the California Delta Loop on which I live. But. . . the flight itself, booked two months ago, would have cost $200 more out of Oakland, and about $250 more from Sacramento. I felt so confident in my decision. My purpose in travel is to make two appearances as Guardian Ad Litem, and I can’t ask for reimbursement for the expenses of this trip. I figured that I’d rise early, park at the BART station, and commute to the airport. Then I took the BART while my son was visiting and started getting nervous. Could I really get to SFO with a small carry-on bag and my pocketbook, down the escalator, through the train doors, the hour to the airport, up the escalator, and over whatever concourse I would have to traverse at that end? And could I really leave my car for five days in the handicapped space at the Pittsburgh BART? I had smugly covered the need for a laptop by leaving one in Kansas City, but did I know where the power cord was? I did not. Confident that the person at whose home I had left everything could find it, at least that part could be deftly addressed, leaving me a bit lighter for not having to lug the computer. Cord located in KC? No. Laptop has to be toted to Missouri. Parking possible long-term at the BART station? Deemed not safe. Corinne capable of BARTing alone for the first time all the way to SFO? Uh, no. Ill-advised, I’m told. Let’s do a few more rounds with a companion, I’m cautioned. Hotel room at SFO: $110. Long-term parking at said hotel for five days: $60. Rolling bag to tote a few personal items and laptop, since computer bag doesn’t roll and rolling suitcases are, you guessed it, in Kansas City having not made the cut in the last minute packing: $40. Dinner at hotel in SF: As yet to be determined, let’s estimate $20. Annnnnnddd, subtracting that from the savings —- I’m thirty bucks in the hole, though truth be told, I’d had to have paid to park at Oakland or Sacramento, so I can probably call it a wash. Along the way, the navigator got me lost and I saw an extra forty miles of California scenery, which I must admit to having enjoyed immensely. Called the Green belt, my lost-as-heck route took me past miles of gentle hills with glorious windmills, just the type of landscape that I most enjoy seeing when I’m lost, and somewhat dismayed, and needing to find a soft place for my emotions to land. It’s the eighteenth day of the forty-ninth month of My Year Without Complaining. Greetings to you all from the BW Grosvenor SFO hotel, where it’s tea time. 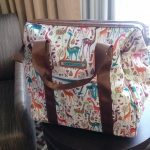 I’m fairly sure this is a child’s suitcase but it has giraffes all over it, which are the symbol of NVC due to being the mammal with the largest heart. 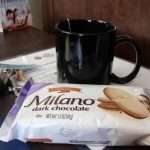 Because who doesn’t like a Milano with their Earl Grey (plain, hot)? This entry was posted in Uncategorized on 19 January 2018 by ccorleyjd365. I would like the Milano, but not the Earl Grey. I prefer black plain tea. Travel is always a hassle. If not this, it would have been something else.